Angela & Guillaume's apartment is finally getting some new (and very needed!) furniture. Everything that they like has been on back-order, but some things arrived just this week. 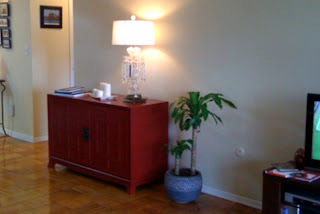 The lamp that Angela's mother gave to them finally has a permanent home on the new Mandarin Sideboard. It's a beautiful piece of furniture, and it holds a lot of stuff in it, too. Guillaume has his new desk! He had some work to do, first. But after a little struggle, and lots of moving pieces... 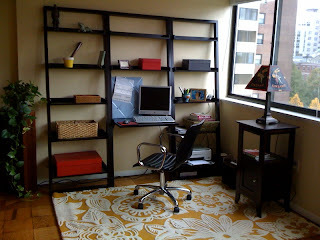 It is all together, and looks so nice with the new rug. And the wait for the couch continues. Hopefully it will be here by Thanksgiving, so the Rousseaus can see it live! Hi Ang, Hi Guillaume ! Miss you both, hope to get together soon. We can't wait - we're so happy you are coming! Avec Mamy, Emilie et la petite Milo en vacances à LUCE, on vient vous faire un gros bisou. Le tapis nous plait beaucoup mais le reste aussi. Angéla a toujours aussi bon goût.